I've always been somewhat of a Jack Black fan. I loved Saving Silverman (one of my favorite movies of all time) and like most of his other movies as well. When I saw that "Bernie" was on Netflix, and that it was listed as a black comedy, I decided it was the movie for me. 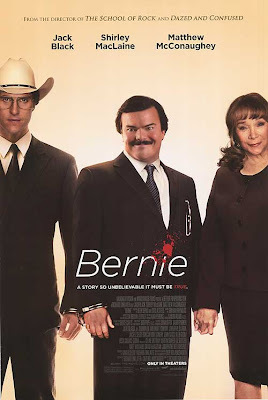 Bernie is based on the 1996 murder of 81-year old millionaire Marjorie Nugent by her boyfriend?, Bernie Tiede, in Carthage, TX. Sounds pretty gruesome but the movie is actually pretty funny. Bernie is an assisant funeral director in Carthage and everyone in the town loves him. He goes the extra mile for everyone he comes across, is a faithful member of the church and is the type of man I wouldn't mind Kate marrying (besides the murderer part). After Marjorie's husband dies, she turns into quite the sour witch. She beats people with brooms, is rude to everyone she comes across and makes Clint Eastwood look like Mr. Rogers. Bernie feels bad for her, so he does his best to know that she is cared for and eventually, she opens up to him and the two become in inseparable. Marjorie has plenty of dough, so they travel the world together and become quite the item. Eventually, she starts to turn mean and possessive, even to him. At first, Bernie does his best to smile and tolerate it until one day he snaps and shoots her in the back with the "armadillo gun" and then throws her in the freezer for nearly a year before he gets busted. The movie mixes in a little bit of documentary format as members of the community are interviewed throughout the movie. It's funny to to see them portray the typical East Texas stereotypes as they talk about their views, stereotypes and thoughts about the situation. It's also interesting to see what people's true views of good and evil really are. Like most indie type movies, the film started to drag on for a bit but overall, I thought it was good watch. "Die replacement friends!" One of the funniest movies! Dude...I never thought I'd ever BE a runner....let alone be a FAN of one. But here I am....both. You are nothing if not inspirational. The great white hope... Scott Kiptecha or Abebe Wietecha (those would be your Kenyan or Ethiopian names.) I don't know...I'm an idiot! It's great to see when anytime one of these younger guys gets anywhere close to you (time-wise) in a race, you come back the next one and absolute destroy any hopes and dreams of them being on top! Erica and I just Bernie on Sunday! I missed the part about it being based on a true story until the closing credits. Doran, I have to hang on while I can! Younger guys have more mojo but the old guys have more old man strength, tenacity and life experience. At the very end of the movie, it shows Jack Black and the real Bernie together. The real life Bernie seemed a little more manipulative, but who really can stand living with a crazy old woman? Oh I get it man....I'm 38. I've got a lot of old guy stuff going on too...mostly the wrong stuff though! My biggest issue is the ITband (as is most runners' issue at one time or another.) I can't seem to get past 11 miles without it hurting. I'm doing every possible stretch I can, some strength stuff (squats, lunges...that sort of stuff) and foam rolling the crap out of it but it still gets aggravated. Any immediate thoughts/solutions?